We WANT your cats to be healthy!!! The doctors at St. Charles Animal Hospital feel that it is important to hear the following information from us…… This is absolutely NOT a sales pitch - there is nothing to purchase from us…. Cats should only be fed low carbohydrate CANNED diets ONLY! Wow, where did that come from? Cats are carnivores. They were designed to eat critters, which are mostly proteins and fats with just a tiny amount of carbohydrates. There are NO DRY FOODS on the market that match what your cat should be eating. So, why are dry foods marketed and sold by almost all manufacturers? They are in it to make a profit; they ultimately do not care about your cat! The extra carbohydrates that exist in dry cat foods lead to the formation of extra body fats, and in a lot of cases, that leads to obesity and even Diabetes. Additionally, cats do not have a large drive to drink water. Their bodies were designed to get water WITH their food, since most critters are made up of approximately 70% water. Dry food is about 4% water content. This lack of adequate water leads to chronic low grade dehydration, urinary tract problems and even urinary obstructions (in males). ANY canned food is better than dry food, but if you want to pick the best canned foods, that web site has a long list from companies who are trying to be honest about their products. We also have a list of “over-the-counter” canned foods that are good for your cats. Please do not pick your cat foods by watching commercials on the TV. In almost all cases, they are trying to sell products to you that are NOT healthy for your cat. 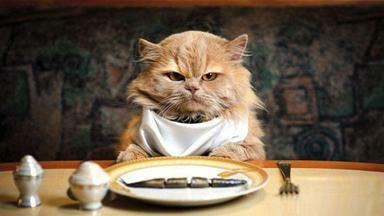 We honestly would like to see healthier cats, and changing their diets is often a great start. The web site www.catinfo.org has great articles on how to safely transition your cat from dry to canned. Feel free to discuss this with any of us at any time.